The latest data reinforces the idea that Spanish house prices are now more or less stable, after years of declines. Figures from Tinsa, a leading appraisal company, and Fotocasa, a property portal, reveal that average national house prices barely changed in January, though prices were up around 3% in big cities and the Spanish islands. The national average price was up 1.1% in January compared to the same time last year, with increases of 2.9% in the cities, and 3.2% in the Balearics and Canaries (chart above). Peak-to-present, house prices are down 41% as a national average, 29.1% on the islands, and 48% on the Mediterranean coast. Average resale asking prices fell 0.3% in January compared to last year, though it rose by the same amount compared to December. Peak-to-present, asking prices are down 45% according to Fotocasa data, and by 50% in Murcia, 48% in the Valencian region, 47% in Catalonia, 45% in Madrid, and 43% in Andalusia. 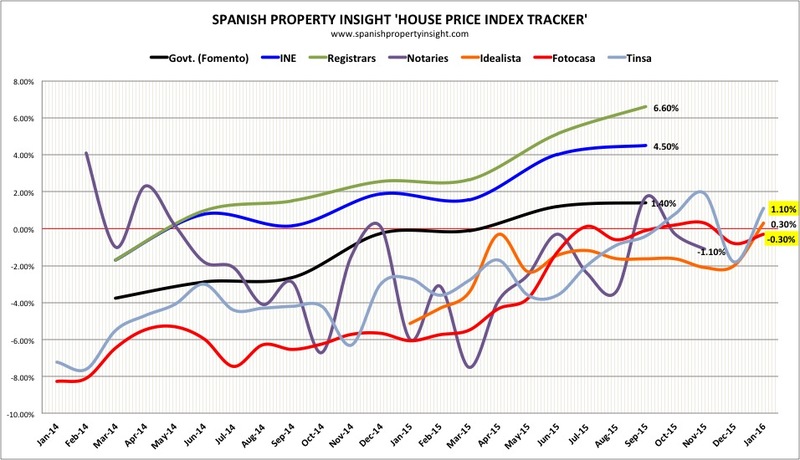 SPI tracks the seven-most important house price indices in Spain, and the latest data supports a picture of prices stabilising but without much sign of taking off anytime soon (latest data highlighted in yellow).